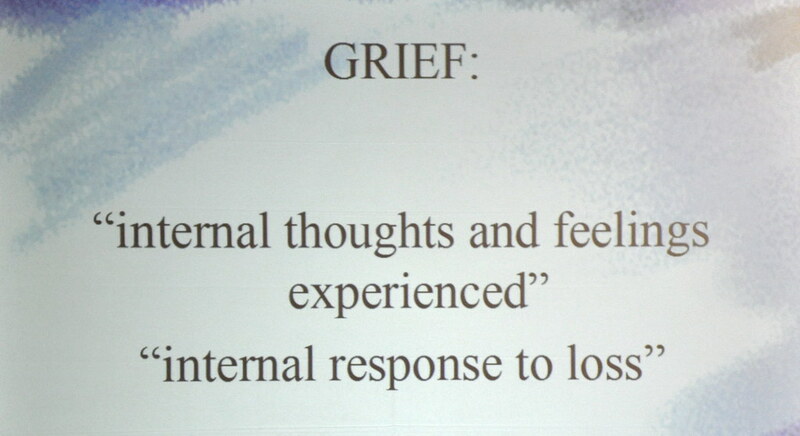 Simply defined, grief is the normal and natural reaction to significant emotional loss of any kind. While we never compare losses, any list would include death and divorce as obvious painful losses. Our list also includes many others; retirement, moving, pet loss, financial and health issues, among them. The range of emotions associated with grief are as varied as there are people and personalities. There is no list of feelings that would adequately describe one person’s emotions, much less an entire society. Just looking at the myth that “time heals” creates the idea that a person just has to wait and they will feel better. We have known people who had waited 10, 20, 30, and 40 years, and still didn’t feel better. And, we know that they would tell you that not only had time not healed them, but that it had compounded the pain. The other five myths carry equally unhelpful messages. Recovery from loss is accomplished by discovering and completing all of the undelivered communications that accrue in relationships. We are all advised to “Let Go,” and “Move On,” after losses of all kinds. Most of us would do that if we knew how. Completion of pain caused by loss is what allows us to Let Go and Move On. It is almost impossible to Move On without first taking a series of actions that lead to completion. Before taking the actions to complete, it is important to look at and often dismiss some of the ideas for myths that we have tried to use with loss, but are not working. The Grief Recovery Method® Outreach Program creates the safety and the correct action choices that help people Move Beyond the pain caused by loss. It is a twelve week program, which creates a safe environment in which to look at old beliefs about dealing with loss; to look at what other losses have affected your life; and to take new actions which lead to completion of the pain attached to a recent loss, or one that occurred long ago. The Grief Recovery Handbook, The Action Program for Moving Beyond Death, Divorce, and Other Losses, (released by Harper Collins in 1998), and an accompanying format written by Institute founders, John W. James and Russell Friedman is used as the text for the Outreach Program. There are 43 losses which can produce the range of emotions that we call grief.